Leo, deep in meditation, mistook his request for a sparring challenge and sent him to bug Mike. Mikey, meanwhile, has been so engulfed in his new video game, “Truth Seekers 7”, that he fails to hear a word Raph says. And lastly, Don misinterprets the “pain inside” Raph as a possible case of parasites. Raph thinks to himself about Master Splinter, who is their father figure, and he has the sudden epiphany as to why he’s so frustrated: He has no mother and he’ll never know who his mother was due to the circumstances of his mutation. Raph finally collapses in tears. Just then, April steps into the barn and asks him what’s wrong. Raph unloads and tells her everything; everything that’s been bothering him since he was a child and just why he’s so angry and frustrated all the time. April holds him and does her best to soothe him. Raph then realizes that he’s always seen April as a big sister or a mother. He then considers what Splinter might say, that families can be created over time. Raph realizes that Splinter would be right. *”The Mother of All Anger” is part of a series of character vignettes written by Will Tupper. The other installments include “Credo”, “Secret Spirit”, “Practical Jokes”, “Fathers and Daughters” and "Conflict Resolution". With “The Mother of All Anger”, Tupper brings up an interesting point about the circumstances behind the Turtles’s birth not often considered. The Turtles had biological parents; they were just normal, dumb turtles. They’ll never know who they were or what became of them because they were plain ole animals. While it might seem silly for the Turtles to pine for the affections of a mother who would basically just be a normal reptile incapable of higher mental faculties, when put in their position I can understand how the emotion could become so frustrating. Or at least it bothers Raph, anyway. Of all the Turtles, Raph seems to actually be the most contemplative regarding their place in the world and how unfair their “uniqueness” really is. In “Sons of the Silent Age” he’s seen lamenting the fact that he and his brothers are the only ones of their kind, that they’ll never procreate and they’ll leave behind no genetic legacy of their own. “Crack in a HardHeart” sees Raph struggle with the concept of not only his own mortality, but that of Splinter’s; wondering how they’ll get by when Splinter passes and cursing the inevitability of death. And here, in “The Mother of All Anger”, Raph despises the circumstances of their origin and that even if he could know who his biological mother was it still wouldn’t bring him any peace. These rare moments of reflection illustrate that there’s a lot more to Raph than the beer-swilling, barroom-brawling badass that so often dominates his surface. He’s far more pensive and introspective than his brothers, or at the very least, he’s less willing than they are to “accept” their lonely existence. When all is said and done, these stories come together to paint a very vivid image of just what it is that ticks Raph off so damn much and makes him lash out at everyone and everything. It also shows why, no matter how long the series runs or how old he gets, he never “mellows out”. His problems run deeper than just teenage angst and there are no solutions to his troubles. But to contradict that last statement a bit, there *are* always substitutions. April’s role as “den mother” to the Turtles within the Mirage series has always been a bit troubling. It makes her very, very boring. She’s their level-headed grounding in reality; a position that’s definitely needed, but comes with the baggage of forcing her to be a dull voice of reason when everybody else is allowed to be at least a *little* fun. It’s a position unique to her Mirage portrayal, as every other piece of Turtle media has sought to remedy her lack of entertaining virtues by making her a news reporter or a ninja-in-training or even a perpetual love interest (or so I’m told; I haven’t watched the new Nickelodeon TMNT cartoon yet). April’s stuck in an unenviable position within the Mirage universe, as attempts to make her “more interesting” (revealing that she’s a drawing brought to life by a magic crystal, having her become the new Nobody and prowl the streets as a vigilante) run counter to the foundation of her character as the tether “grounding” the Turtles to reality. It’s definitely a catch-22 and I understand why most other Turtle properties avoid trapping her in such a position. Artist Jon Landry lays out some nice pages and I appreciate his firm grasp on perspective and foreshortening; it makes his panels “pop” and gives them a better sense of depth. While his Turtles are inexplicably “veiny”, I really dig his animated take on their expressions. Landry would’ve been a good choice for a comic based on the 4Kids TMNT cartoon, I think. I suppose my only real complaint is with that last panel, which is beautiful in spirit, but bothersome in that Raph’s arms are like 12 inches wide and he kind of looks like the Hulk. 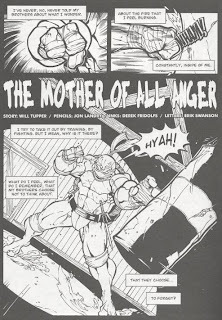 As with all the vignettes in Tupper’s series, “The Mother of All Anger” is a poignant look at the inner workings of the Turtles. As a singular explanation for Raph’s anger, the “mother” thing may not hold up, but when combined with all his other moments of introspective frustration, it helps us to see the whole picture. an eye opening and "d-uh" moment all in one. I never in a million years would have considered the fact that the turtles actually never knew their biological parents, and I never considered their need to, well "need" them. But the truth is, their father, splinter, and their mother, April; have both been their the whole time. Yea sometimes i forget they are actually after all only "teenage" mutant ninja turtles.